Result: Cameron Norrie defeated Jay Clarke by 6-4, 6-3. Although, Jay Clarke opened the scoring of the first set but he was not able to extend it enough for his opponent. Cameron Norrie recovered the lead after some time and eventually won the first set by two points. In the second set, Jay Clarke again took the lead while on the other hand, Cameron Norrie was also scoring points very quickly. Britain’s Jay Clarke says it is “more of a surprise” when he does NOT receive racially abusive messages on Twitter following a defeat. In the end, the British player, Cameron Norrie won the second set too and made it to the next round. Cameron Norrie will now play Lukas Lacko in the Quarter finals of Eastbourne Tennis Intl 2018. Result: John Millman defeated Leonardo Mayer by 7-6(7), 7-6(4). An exquisite performance was witnessed today between John and Leonardo as they both gave their best performance today. John Millman took the lead in the opening set of the match and was scoring points at a very fast pace. However, on the other hand, Leonardo Mayer was also scoring points and eventually, the set came to a tie-breaker. Leonardo Mayer faced defeat in the first set as he lost a total of four points on his serve. However, again an absolute and dazzling performance was seen between them as the second set also came to a tie-breaker. John Millman again claimed the victory in this set as Leonardo Mayer failed to score three points on his serve. John Millman will now face Marco Cecchinato in the Quarter finals of Eastbourne Tennis Intl 2018. Result: Mikhail Kukushkin defeated David Ferrer by 6-2, 6-0. The Kazakhstan player, Mikhail Kukushkin showed an outclass performance today as he easily dominated David in both sets. In the first set, Mikhail took the lead and was extending it at a very fast pace. On the other hand, David Ferrer only managed to recover a total of two points and lost the first set. The second started and Mikhail Kukushkin again took the lead after a couple of minutes. It was an eyecatching performance by Mikhail as he did not let David Ferrer to score a single point throughout the set. Mikhail Kukushkin finally made it to the Quarter finals of Eastbourne Tennis Intl 2018 where he will play against Kyle Edmund. Result: Kyle Edmund defeated Andy Murray by 6-4, 6-4. Kyle Edmund opened the scoring of the first set and was scoring points quickly. On the other hand, the British star, Andy Murray was also in action and scoring points at a very fast pace. In the end, Andy Murray failed to win the set as he lost the last two points in a quick succession. The next set started and this time Andy Murray opened the scoring. Despite his hard work and good efforts, Andy Murray again failed to win the second set and got out of the tournament. It was a terrible defeat for the British star as he was looking forward to the Wimbledon Open with some hope. Kyle Edmund beats Andy Murray 6-4 6-4. Feels like a significant moment in British tennis as Murray loses to a compatriot for the first time since Bangkok 2006 (Tim Henman). But doesn’t quite have the “passing of the torch” feel that Murray’s win vs Henman in Basel 2005 did. 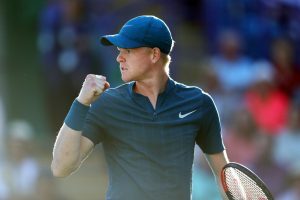 Kyle Edmund made it to the Quarter finals of the Eastbourne Tennis Intl 2018 where he will play against Mikhail Kukushkin. Result: Jelena Ostapenko defeated Mihaela Buzarnescu by 6-1, 6-2. A breathtaking performance was witnessed by Jelena Ostapenko as she easily dominated Mihaela in both the sets. Jelena Ostapenko opened the scoring of the first set and was extending her lead at a very swift pace. However, Mihaela Buzarnescu failed to recover the lead as she lost many points on her serve. In the end, Mihaela faced a humiliating defeat as she was only able to recover a single point throughout the set. However, in the second set, Mihaela Buzarnescu took the lead but she failed to extend it for his opponent. Jelena Ostapenko recovered the lead after some time and eventually won this set too by a total of four points. Jelena Ostapenko advanced to the Quarter finals of Eastbourne Tennis Intl 2018 where she will play against Agnieszka Radwanska. Result: Aryna Sabalenka defeated Elise Mertens by 7-5, 2-6, 7-6(4). What an absolute and exquisite performance was witnessed between Aryna Sabalenka and Elise Mertens throughout the match. The Belarus professional, Aryna opened the scoring of the first set and was extending it quickly. Elise Mertens however, managed to recover some points but lost the set by two points in the end. The second set started and this time Elise Mertens took the lead as Aryna failed to score on her serve. Elise Mertens gave her best in this set and ultimately won it by 6-2. The match came to the decisive set in which both the players played confidently throughout the set. After a very tough fight, the set came to the tie-break and the Belgian star, Elise Mertens eventually lost it. Aryna Sabalenka will now face Karolina Pliskova in the Quarter finals of Eastbourne Tennis Intl 2018. Result: Daria Kasatkina defeated Anastasija Sevastova by 6-4, 6-4. A breathtaking performance was witnessed by the Russian star, Daria Kasatkina as she won both the sets in a rhythm. Anastasija Sevastova took the lead in the opening set of the match and was scoring points at a very fast pace. On the other hand, Daria Kasatkina was also scoring points quickly. The score reached 4-4 but eventually the Russian, Daria sealed her win in the first set as Anastasija Sevastova lost the last two points in a quick succession. The match moved to the second set and again the Latvia player, Anastasija took the lead with a powerful shot. However, Daria Kasatkina again recovered the lead and finally won the second set too. Daria Kasatkina made it to the Quarter finals of Eastbourne Tennis Intl 2018 where she will now play against Angelique Kerber. The match was to be played between Petra Kvitova and Agnieszka Radwanska. But unfortunately, Petra Kvitova failed to play the match as she got a hamstring injury. Petra Kvitova said in the news that she got the injury while she was playing in the Birmingham. Although Petra Kvitova has won five title this year but she really wanted to play in the Wimbledon Open. Agnieszka Radwanska gets a walkover into the quarterfinals. Result: Neal Skupski and Ken Skupski defeated Michael Venus and Raven Klaasen by 6-2, 6-4. Although, Michael Venus and Raven Klaasen opened the scoring of the first set but they failed to extend it for their opponents. Neal Skupski and Ken SKupski not only recovered the points instead they won the first set by a margin of four points. In the second set, Michael Venus and Raven Klaasen took the lead while on the other hand, Neal Skupski and Ken SKupski were also scoring quickly. The score reached 5-4 but eventually Neal Skupski and Ken Skupski claimed victory in the second set. 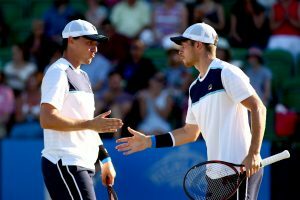 Neal Skupski and Ken Skupski will now play against Ryan Harrison and Nicholas Monroe in the Semi finals of Eastbourne Tennis Intl 2018. Result: Jonny O’Mara and Luke Bambridge defeated Juan Sebastian Cabal and Robert Farah by 3-6, 6-3, 10-5. Juan Sebastian Cabal and Robert Farah took the lead in the opening set of the match and were extending it at a very fast pace. Jonny O’Mara and Luke Bambridge struggled hard to recover it but they eventually failed in doing so and lost the first set by three points. In the next set, Jonny O’Mara and Luke Bambridge opened the scoring and were playing confidently. In the end, Juan Sebastian Cabal and Robert Farah failed to win the set as they lost some points. The match came to the deciding set in which Jonny O’Mara and Luke Bambridge again took the lead. Although, Juan Sebastian Cabal and Robert Farah tried to recover it but eventually they failed to do so and lost the decisive set. Jonny O’Mara and Luke Bambridge will now face Edouard Roger-Vasselin and Robert Lindstedt in the Quarter finals of Eastbourne Tennis Intl 2018. Result: Gabriela Dabrowski and Xu Yifan defeated Timea Babos and Johanna Konta by 6-4, 6-4. Timea Babos and Johanna Konta opened the scoring of the first set as Vania and Katarina failed to score the first point. On the other hand, Gabriela Dabrowski and Xu Yifan were also scoring points quickly. At last, Gabriela Dabrowski and Xu Yifan won the first set by two points after a tough fight against their opponents. In the second set, Timea Babos and Johanna Konta again took the lead and were playing very confidently. But Gabriela Dabrowski and Xu Yifan eventually claimed the victory in this set as they scored the last two points in a quick succession and made it to the Semi finals of Eastbourne Tennis Intl 2018.